Temporary vascular occlusion can be a useful technique for producing local hypotension to facilitate the dissection of technically difficult cerebral aneurysms. Hypothermia can be used to increase tolerance to occlusion, and cortical function in the territory of the occluded artery can be monitored during the occlusion using somatosensory evoked potentials (SSEP). SSEP were monitored during temporary vascular occlusion for cerebral aneurysm surgery under moderate hypothermia in 55 patients: 25 with middle cerebral artery aneurysms, 10 with aneurysms of the internal carotid artery, and 20 with anterior communicating artery aneurysms. Tolerance to vascular occlusion at 28 to 30 °C, as manifested by the SSEP, varied widely, ranging from loss of the SSEP after 4 minutes of middle cerebral artery occlusion to preservation of the SSEP after 55 minutes of middle cerebral artery occlusion. Patients undergoing emergency surgery, those with a neurological deficit — either a transient deficit occuring at the time of subarachnoid haemorrhage or a persistant preoperative deficit — and those subjected to repeated vascular occlusion appeared to be prone to loss of SSEP during occlusion. 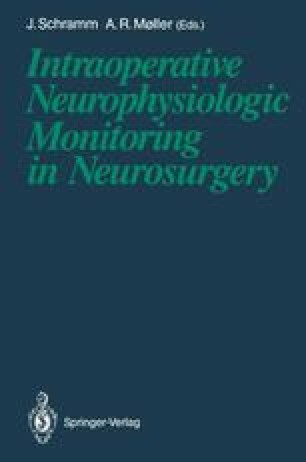 The fact that at least 2 minutes of continuing occlusion after loss of the SSEP were tolerated in the pathway of the SSEP without permanent postoperative neurological deficit shows that changes in SSEP provide an effective early warning of ischaemic damage. On the other hand, severe ischaemia in areas not in the pathway of the SSEP, such as the internal capsule and Broca’s area, could not be detected by monitoring median nerve or posterior tibial nerve SSEP. We believe that moderate hypothermia has made a significant contribution to our patients’ ability to tolerate relatively long cerebral artery occlusion times, as shown by the low postoperative morbidity in our cases, and that it deserves reappraisal for use in this situation.